There are so many fantastic people in London and for the past year I’ve been guilty of commuting past them all. I’m trying, therefore, to throw in a quick weekly strangers project shoot after work. Yesterday saw me and Bomvu/Colin up on Brick Lane to this end. The evening started with four straight rejections, however, with people head down marching home from work. As it started to rain we headed back towards Liverpool Street, admiring the vintage doorways along the way. Though I’d met some interesting people on Brick Lane, and had a portrait shot with a super girl Holly, I’d rushed things and made a couple of mistakes as I dodged traffic in the middle of the road. (Holly’s kindly emailed, and a processed picture will be headed her way, as with everyone I shoot in or out of the official project). 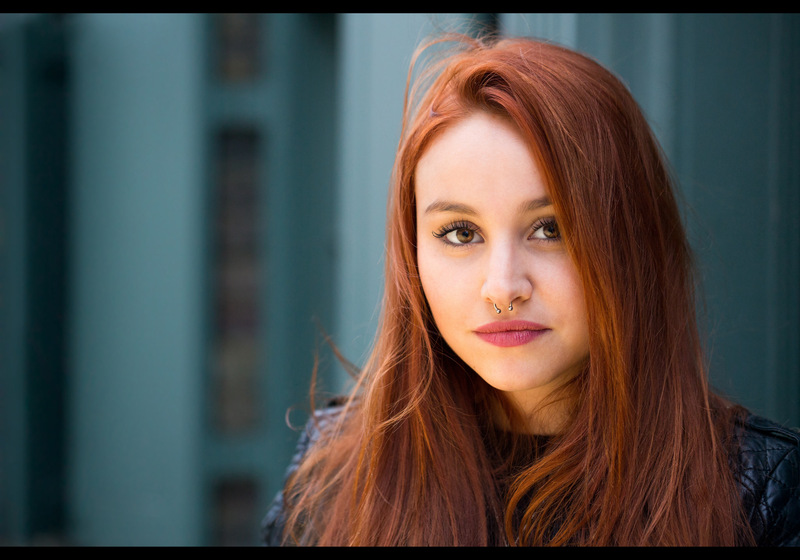 With the rain building I’d seen Emma outside a pub with friends, very theatrical and swishing her vibrant red hair in contrast to the grey light of the closing weather. Doubling back, credit for the background goes to Colin, who spotted the nuanced turquoise doorway I’d missed (he’s also helping with the gold reflector here). Emma and friends were fortunately just finishing their drinks and were happy to leave the shelter of the pub’s awning to swing round the corner into the rain. Emma’s Italian, just finishing an internship here in London, before heading back to her native Venice. I’ve been lucky enough to shoot some of my earlier portraits in Venice, and Emma shares the same instinctive poise and style. After a quick chat, the rain threatening to intensify again, we said our ciaos. Thank you Emma though for taking the time to divert your evening, and tolerate a share of perfectly avoidable rain, to be part of the project. Safe travel back home; I hope you have a fantastic final few weeks in London. Grazie mille! This is portrait #44 of my 100 Strangers Project – check out the group page and get involved.